But I will tell you all about the party as it gets closer. Here is the other story! 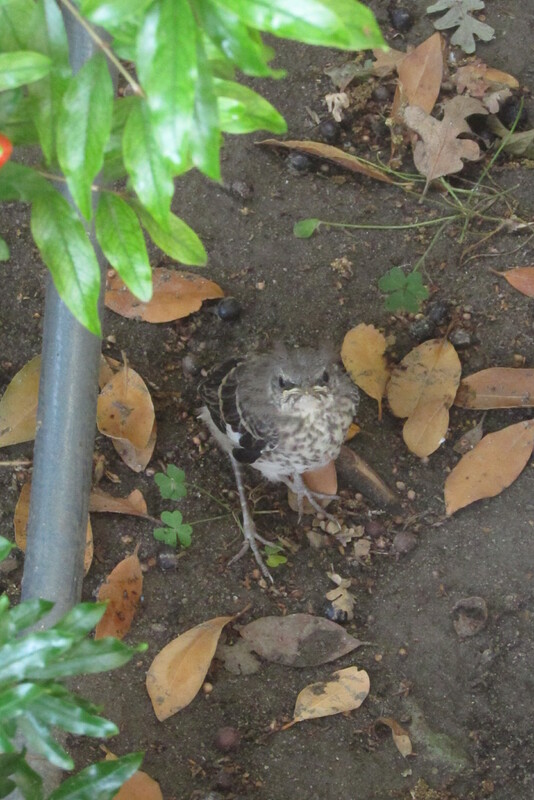 I was walking through my front garden area when some mockingbirds starting calling and swooping around my cat. They had been at this for awhile, but I finally really took a look around. 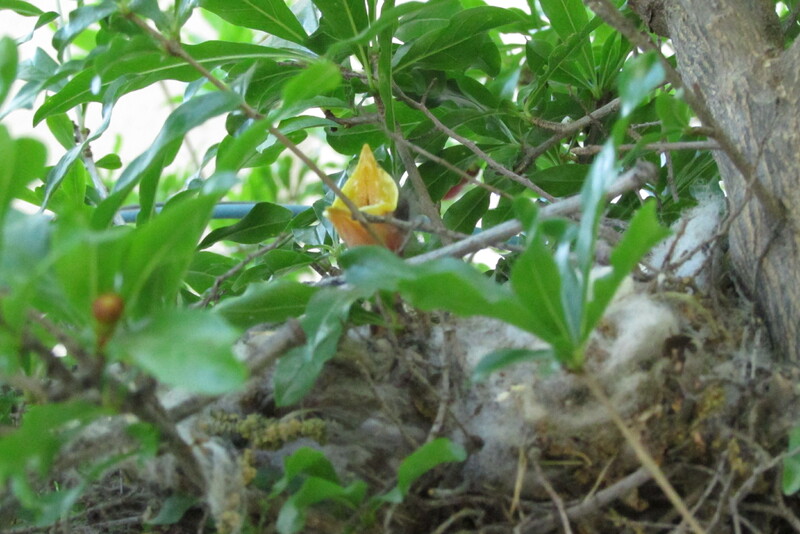 There is a smallish pomegranate tree right by my kitchen window, and sure enough, there was a nest! I stood and listened for a bit, but didn’t hear anything, so I thought there were just eggs. I pulled a chair closer, climbed up and suddenly there were little beaks poking up! I was so surprised and excited! I was even able to get these great pictures! 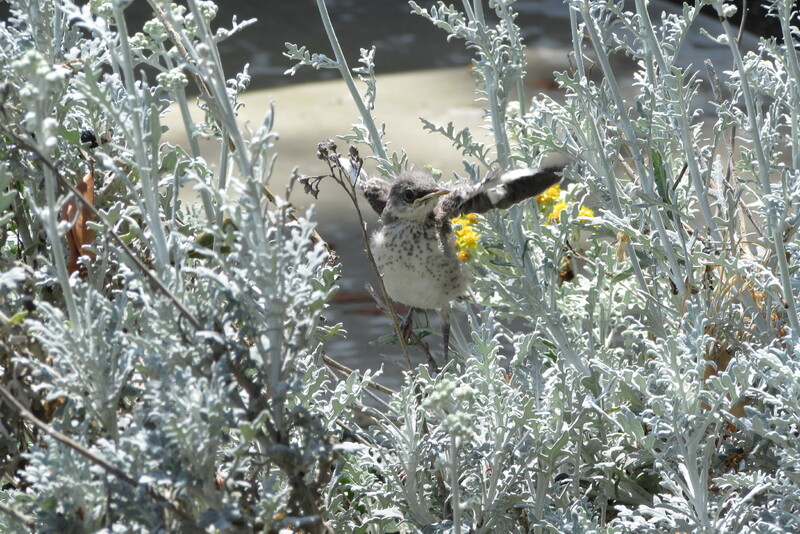 The momma and daddy kept chirping, but they let me snap away. It was just when the cat came by, that they got very upset, even pecking at her! I waited about a week and then took these pictures. They now have fuzzy heads and their eyes are open. 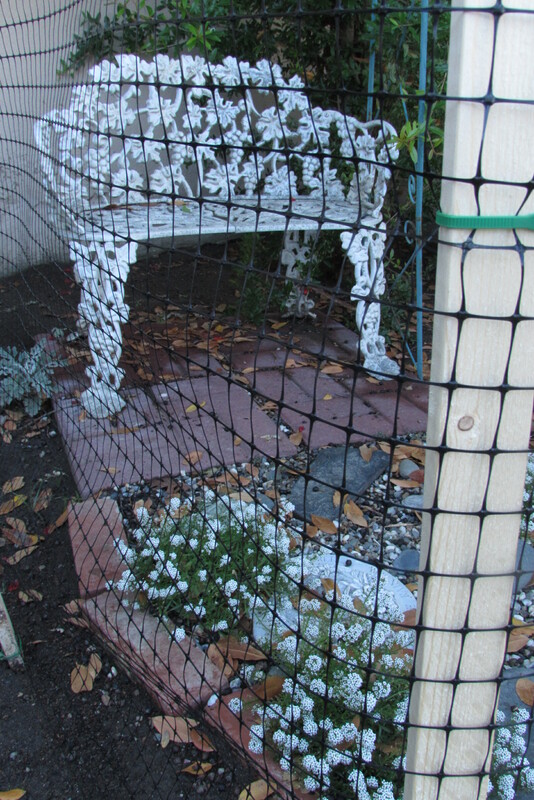 I told my husband we needed to get some temporary fencing to try and protect the babies from the cat. 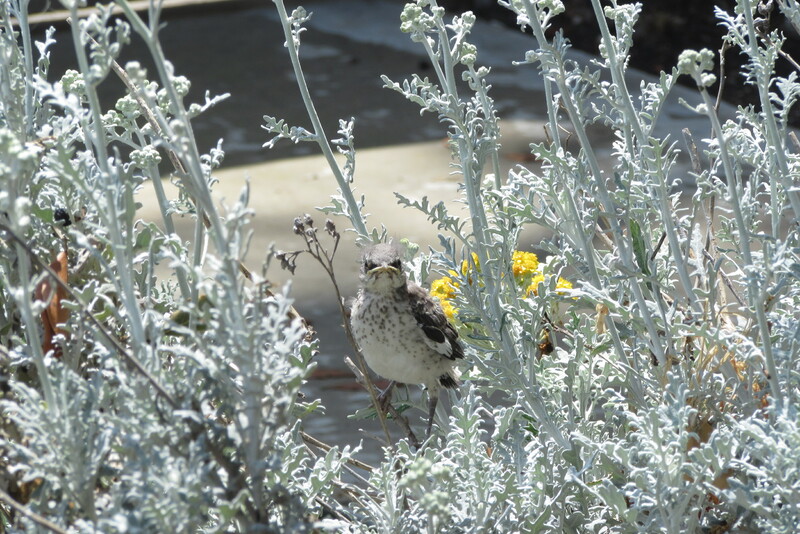 I had read online, they leave the nest after about 12 days, but then they are on the ground for another week or two. This was going to be quite an interesting couple of weeks once they were out of the nest! So we added some fencing on Friday night. I woke up on Saturday morning, took a look out the window, and saw this! That wasn’t one of the babies was it! No way! I waited a bit, then saw another one on the ground-on the other side of the fence!! That wasn’t supposed to happen! This was only 2 days after taking the ‘week later’ picture and a day after the fence was put up! Haley and I tried to decide the best way to get the one baby back inside the fence. We knew it would never survive in the yard with our ‘wild’ animals. But we didn’t want to be attacked by momma and daddy either! Wrong side of the fence! Our solution was quite hysterical! I held up a big patio umbrella over our heads so we wouldn’t get divebombed and then Haley, with gloves on, picked up the baby and put it back in the fence. Whew! We did it! 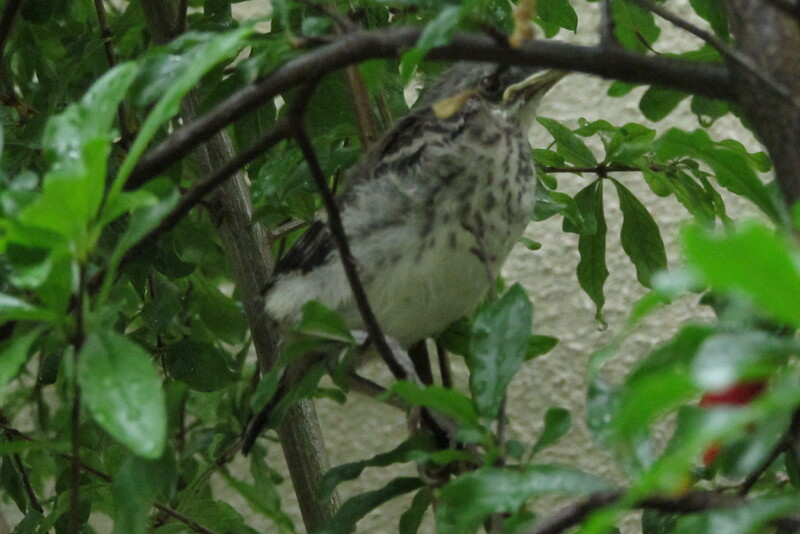 So far, we have only seen two, but the other might be in the pomegranate tree. They are pretty hard to find in there. Well, after awhile we couldn’t find the babies at all, but we still heard them. 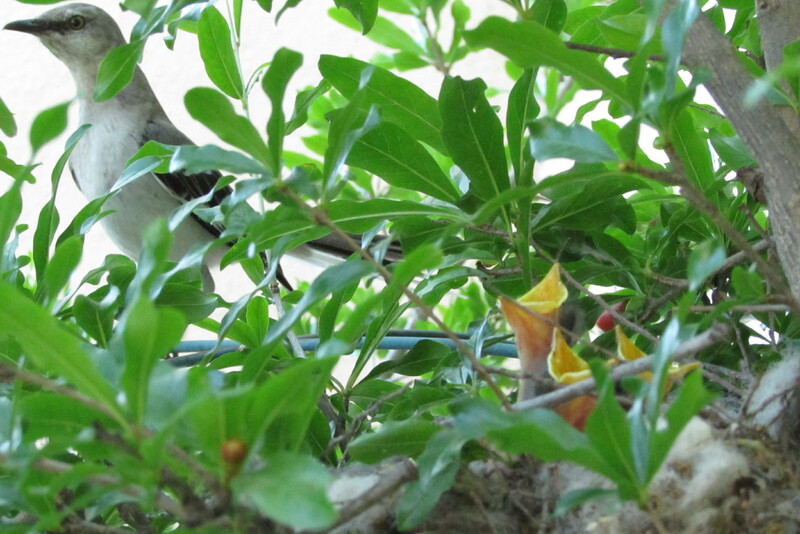 There is another tree overlapping the pomegranate tree, so we figured they were in that one. It has been another week, I still hear one of them chirping, but they are too high for me to find. I am just thankful we were able to protect them when they were on the ground. Now that they have flown the coop, we can get on to that graduation party!! Thanks for the invite to this post! Great pictures! You were able to get so close! Fun to watch God’s creation. You get so involved in protecting those babies, don’t you. I laughed at the picture in my mind of you using umbrellas. Genius idea! I’m so glad you got a chance to read the story! It is pretty crazy how much we did for those babies! Have a great weekend! oh my goodness how fierce are those baby birds!! how awesome of you all to ensure their safety. What weird birds too that they would jump down to the ground for a few days! It was fun to watch them! Thanks for coming by! Those are absolutely amazing baby bird pictures! I’m stopping by from Snickerdoodle Sunday. Thanks for coming by and for the invite! We will check it out! I was a lot of fun to watch them grow! Thank you for coming by and have a Happy Mothers Day! It was fun and I was amazed the parents let me get so close! Thank you for coming by! the end of it……….was sad to see them go!! sweet that yall put up the fence to protect them. It was a lot of fun and you’re right, it goes really fast! Once they are out of the nest, that’s it! 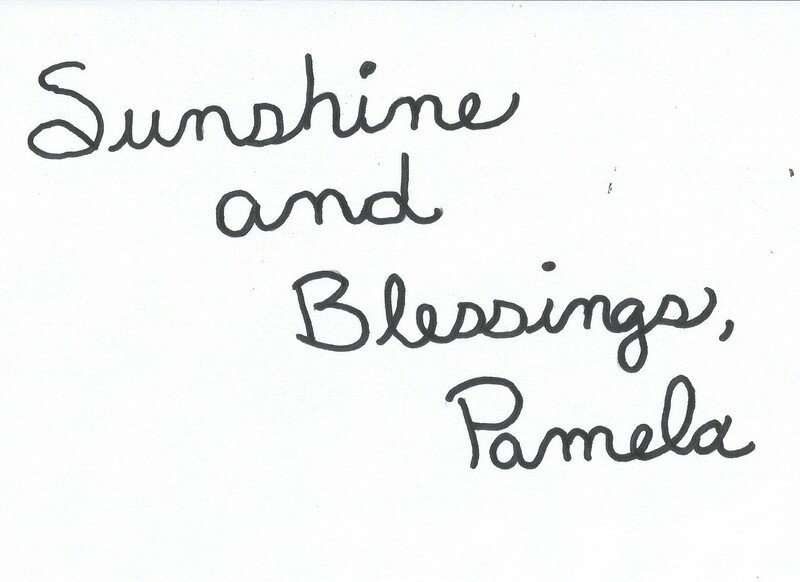 Thanks for coming by and Happy Mother’s day to you too! What a wonderful story and such great pictures. I have to wonder if you are in southern California? Pomegranates don’t just grow everywhere and you mention the beach on your about page. 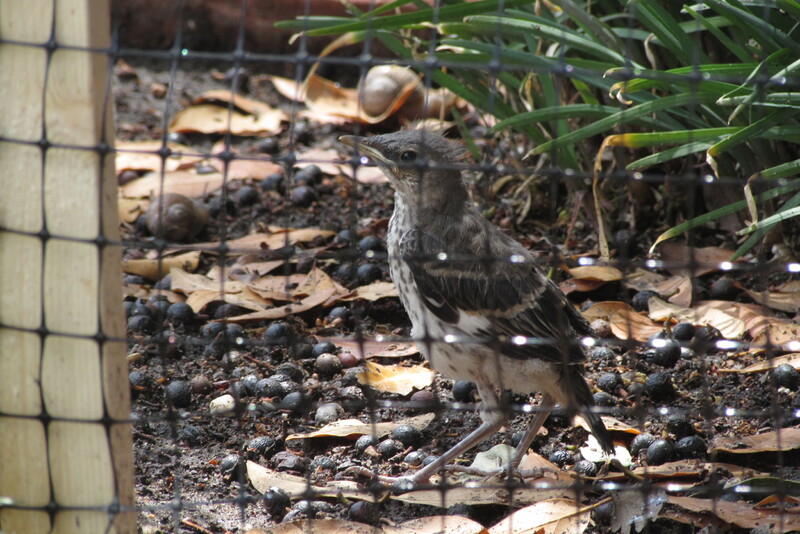 We have cats — and lots of mocking birds, too. They often nest in the orange trees but they are to high up to see the nests. But they do not like my cats! It is so entertaining to watch them dive bomb them as you described! FYI – Deb from Frugal Little Bungalow sent me over and so glad I came! My friend Joyce came by, too and left a comment but it disappeared — you might want to check your spam. WordPress never likes her! Thanks for coming by! I live in the Central Valley of California. We are about 2 hours away from the beach and 2 hours from the mountains. Right smack dab in the middle! Yes, my poor cat even got pecked by those birds, but of course, she wouldn’t leave them alone either! Thanks to all of you for stopping by and I will go searching for your friend! This is so beautiful! God bless you for intervening on behalf of the birds! 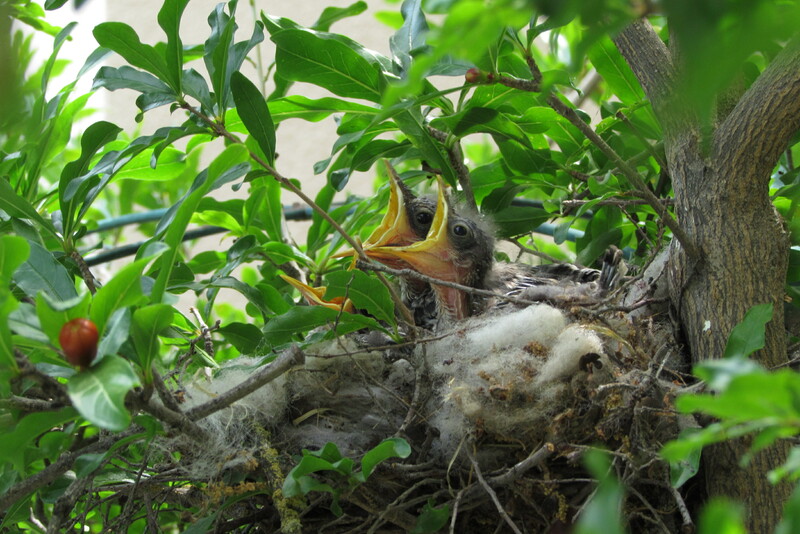 Your photos are lovely – some of the sweetest and best I’ve ever seen of nestlings! Best wishes on the party! I found you! YOur friend told me you might be in my spam box, and there you were! The photos were really fun to take. I was suprised the parents let me get so close! Thank you so much for coming by! I LOVE this story!!! And I know how excited you must have been to get the photos of those darling babies. What a drama indeed to try to protect them. Thanks for coming by! It was really fun to watch the babies and the mama and daddy. It really is an amazing process they go through and sooo fast! The morning doves will not leave the nest so we can walk right up to the flower pot where the nest is and they just sit there!! This is sweet, they are adorable! Thanks Pen! It was fun to watch them!